Having drunk very little alcohol in my life and knowing next to nothing, I'm interested in deciding upon a favorite beer and a harder drink. Rather than anecdotal advice, I'd appreciate either YouTube videos, online quizzes, flowcharts (either formal ones or photos of chalked ones on bars), Android phone apps, websites, or anything interactive that would recommend brands and drinks based on flavors. With no disrespect intended, I'm not as interested in anecdotal advice right now. My normal drinks are usually a diet soda, water, or very occasionally juice. In college, I usually drank Miller Genuine Draft and shuddered until I couldn't taste it, then would proceed to get drunk. I'm interested in this mostly to match others who are getting relaxed at social and work events, but also for my own occasional relaxation. I think the first step is to actually use your taste buds and try a few beers in different styles rather than going through the obscure taste descriptors. Search for a "flight of beer" in your area; I'm sure there are beer focused establishments that do this (a set of 4 or so mini glasses of beer in different styles). A local brewery with a tap room offering samples is the other way to go. I think tasting a little bit of different styles will make it easier for you to narrow down using any online resources or whatever afterwards. This article may be a good general start. For beer, this guide is handy; if you prefer a flowchart format, this is serviceable but not as educational or as detailed. For on-the-fly recommendations, when you're at an event or out shopping, RateBeer can be helpful for figuring out particular beers -- pretty sure they have an app as well, but I've only used the site, myself. For spirits, this is a good beginner's resource if nerding out would help you learn. A lot of online quizzes are just thinly-disguised efforts to drive traffic to cocktail recipe pages, and if you tell your bartender you want a 'Glad Tidings' or whatever, they're gonna look at you funny. Any decent bartender will know the drinks on this list, so unless you're at a cocktail-oriented spot, I advise sticking to it. From what you say in your question, you're most likely to enjoy light spirits -- vodka, maybe gin or a light rum or tequila -- in highball/long drink format (that is, with ice and soda or other mixers). Moscow Mules, Cuba Libres, Seabreezes, Greyhounds/Salty Dogs, and Palomas are all good bets. Or a Negroni, if you like bitter flavours. Similar cocktail advice in flowchart format. A quick google search comes up with this for spirits. Neutral spirits like vodka don't really add flavor to drinks, so your preferences in mixers will likely make you happy. If you find one beer/cider you like (or a style you like), Untappd is pretty good at recommending other beers. 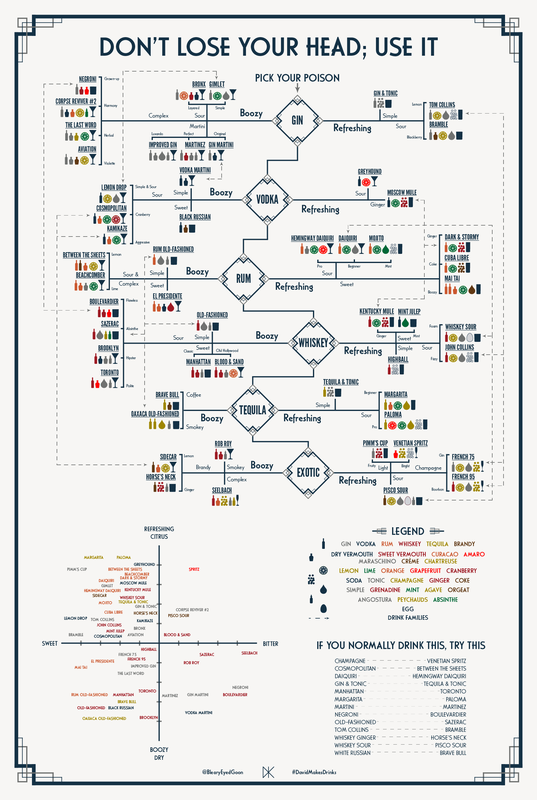 In something not-quite-flowchart-y, Pop Chart Lab does some cool visualizations of both styles of beer and representative famous examples of each style, so that might also help. Honestly, you're in a fantastic city for beer, so equipped with tools like these I would definitely recommend going out to somewhere known for having a wide tap list and talking with someone there to try out a few tasters. It looks like there's even places in your area that do "Beer 101" classes, that might be fun. Now, the caveat to all this (and the caveat to a lot of the answers here based on who'd be interested in answering them) is that these are answers from a beer-nerd's perspective. In other words, I'm interested in showing people cool styles and varieties, but these answers aren't going to be as helpful if you're just interested in whatever's likely available at a work event where it's probably "Bud Light, Goose Island, and maybe some Strongbow". There's tasty styles for a wide range of taste buds (loosely: Hoppy, Malty, and Sour; with fruit-forward being another dimension); but that doesn't help if you find out you really like cherry beers (kriek) but you can't find them at the events you want to drink at. All that said, if you end up with more individual questions or want to get into some personalization, MeMail me and I'd love to help you out. I know a few "go-to" starter beers I like to recommend based on what flavors people otherwise like/dislike, and I might be able to offer some more guidance with that. Most people who like beer like talking about it. See if you can go to a brewery or place that serves a lot of craft beer when they're not crowded and be willing to ask questions. Most places will serve a flight (2-4 oz pours of a lot of different beers - if they won't, go someplace else). Going when they're not busy is important. Your profile says Chicago, so Goose Island might be a good choice although I'm sure there are lots of others. It's awesome because if you like brown ales (for example), you'll probably like dopplebocks as well. This research is best done in person. Find a taphouse near you with beer flights or a tasting night, and keep trying things. Ask the tender for help and have one or two things in mind but be willing to try stuff. Or, go with your friends and everyone orders something different and you trade sips. You have fine goals but the journey is the thing here. Did you have a process like this for finding your favorite foods/dishes, or did you just eat a lot of things until you stumbled on the good stuff? Beer flavor is so hard to talk about, you're better off first finding out what you like in terms of scales. Dark or light? Bitter or sugary? For example, I like very dark porters and very light wheat ales, and fruity shandy, but I find brown ales in the middle of that spectrum sort of boring. Paradoxically I think Belgian style double/triple brews are great. I don't like bitter/hops so no IPAs please. You might find that you like some styles more than others, but not necessarily only one favorite drink. Please do avoid the big name beers like Miller, Budweiser, Corona, anything with a national ad budget. Ditto for the cheap huge boxes that frats get, like Natural Ice. If it's sold at scale, or for cheap, it is just going to be wheat-water.